Irrespective of whether you are a man or a woman, there any chances that you will suffer from the problem of dandruff for at least once in your life if you already haven’t. Thankfully, treating dandruff doesn’t come at a cost. There are many amazing ways to cure dandruff that help have a healthy scalp without you having to compromise on the looks of your hair. The first and most important question that probably strikes your mind is whether a woman can get dandruff. Well, women are as prone to developing dandruff as men are. And because dandruff is mostly caused by microbes that are found in both male and female scalps, you cannot stay away from this problem for long, even if you are a hygiene-conscious woman. The exact reason behind dandruff is not known to scientists. But, certain associations have been made between different factors. Increased oil secretion and production are one of the major causes of dandruff. Bacteria don’t result in dandruff, but poor hygiene is also a cause of developing this condition. People who do not wash or shampoo regularly have to deal with this condition. The body’s immune system may also have a role to play. People who suffer from severe dandruff could be a victim of chronic illnesses like AIDS or Parkinson’s disease. Other triggers include stress, weather conditions, poor immune system, and genetics. In order to get rid of this condition, many rely on a good dandruff shampoo for women. Just because you do not see a lot of dry skin flakes on your hair or shoulders, doesn’t mean you don’t have dandruff. Dandruff is more visible in men simply because they generally keep shorter hair. If you are a woman who has long tresses then it is certainly difficult to figure out if you really have dandruff. Sadly, dandruff plays its part even when it’s not visible. That means, even if a lot of dry skin flakes are not clearly visible in your hair or scalp, they are going to cause harm to you if they are stealthily there. And that is the reason why you should treat dandruff as soon as you find out you have got it. And the best way to find out if you have dandruff is through its symptoms. Yes, the most common symptom of dandruff is the appearance of dry, flaky skin in hair and on the scalp, but that’s certainly not the only symptom. Some other symptoms include redness of the scalp, itchiness, and scaling. If you experience any of these symptoms, then it’s likely that you are suffering from this nasty dermatological called dandruff. Dandruff causes a great deal of damage to your scalp. And that is why if you have found out that your hair has dandruff in it, then taking steps to do away with it is highly advisable. The reason why you should address this problem at the earliest is that it hampers the growth of your hair. And women generally love long, healthy hair, getting which might become an uphill task with dandruff on the scalp. If you want to maintain a healthy scalp or wish to restore the health of your damaged scalp, then it is important to use a good dandruff shampoo for women. Cleaning dandruff in your hair with an antidandruff shampoo will make it easy for the hair strands to grow without hindrance. If you are a woman, then it’s probably not just getting rid of dandruff that you want from your shampoo, you also want hair-beautifying properties in it. And that is why you should choose a shampoo that doesn’t just address the problem of dandruff but also does its part in beautifying your hair, leaving it shiny and healthy. A healthy fragrance and a little moisturizing essence are a must in the shampoo. So with the best dandruff shampoo for women, you will not just be able to do away with all those irritating symptoms of dandruff-like dryness, itchiness, and redness, but also will be able to get enviably beautiful hair. Some shampoos are also packed with volume inducing properties. So, that means when you use such a shampoo, your thin hair receives some volume. It would be beneficial for you to remember that dandruff treatment is not a one-time affair, it is a continuous process. Hence, if you are using an anti-dandruff shampoo to treat dandruff, you should use it regularly. Only a single wash is not going to help you uproot the problem. This is because dandruff is something that comes back when the conditions are favourable for it. So, this simply means that dandruff cannot be cured permanently. 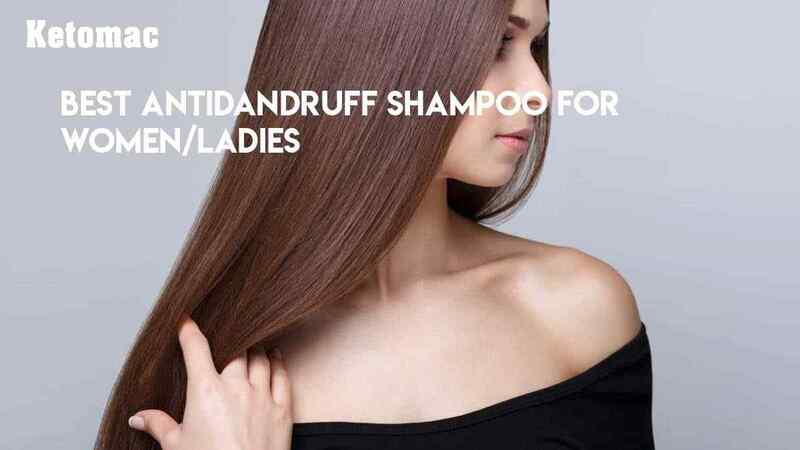 For effective results, you will have to use the best anti dandruff shampoo for women, and wash your hair every now and then so as to have silky-smooth hair, free of dandruff. It’s also not advisable to keep switching between beauty and antidandruff shampoos. Once you use a beauty shampoo, you remove the anti-dandruff protection that your antidandruff shampoo must have ensured for your scalp. Hence, try to stick to your routine- don’t swap your antidandruff protection for beauty. If you do a thorough search in the market, you will come across a large number of brands dealing in anti-dandruff shampoos. But if you want to treat dandruff without any side effects, then opting for a best medicated anti-dandruff shampoo would be the best bet. But remember quality matters a lot. And when quality is concerned, there is nothing that can beat Ketomac antidandruff shampoo. It is the most reliable antidandruff solution available today, and the credit for that definitely goes to an ingredient called ketoconazole. Being a synthetic broad-spectrum antifungal agent, Ketoconazole anti dandruff shampoo removes microbes like fungi from your scalp effectively. Ketoconazole anti dandruff shampoo is present in the shampoo in a concentration of 2%. So, the problem of an overdose doesn’t really arise here. For desired results, you will have to apply the shampoo to wet hair and scalp. Make sure you massage your scalp and hair well with a little product and try to form the lather. Leave the shampoo on your scalp and hair for around 5 to 10 minutes, before using it off thoroughly. If you have just begun using this shampoo for dandruff treatment, then apply it twice a week for about a month. After that, you can reduce the number of applications to once a week. This will help prevent the recurrence of dandruff. See to it that you do not completely stop using Ketomac because that could help your dandruff make a comeback. So, women need to take good care of their hair like using the Ketomac shampoo regularly, if they want to stay away from dandruff.